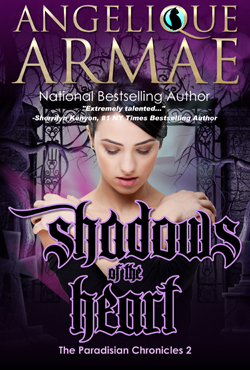 SHADOWS OF THE HEART is the second book in National Bestselling Author Angelique Armae’s bestselling angels and demons series, The Paradisian Chronicles. To save their unborn child from Lucifer, Hell's sexiest bad boy-Nicolai Valentine-and his demon slayer wife-Isabel Heart-must retrieve a cursed diamond containing a deadly hell-bred entity. Can they prevail when they'll have to battle rebel demons, navigate a killer labyrinth, and face their darkest fears? When the love for a child is veiled in darkness, Hell hath no fury like the SHADOWS OF THE HEART. Fallen angel, Nicolai Valentine, is determined to save his unborn child from Lucifer. The Devil already slaughtered Nic's two little boys, losing a third child to the beast, isn't happening. But being caught with Lucifer's severed wing in his hand, a crime he did not commit but can't prove otherwise, Nic is blackmailed into stealing a cursed diamond from a renegade outpost in Hell's Rust Provence. Which wouldn't be a problem save for the fact The Rust is the section of Hell Nic was born to rule but refuses because the official princely position would secure him a place on Lucifer's Council, damn his soul, and pit him against Paradise. But if he doesn't play nice with his twisted uncle, the soul of his unborn child will be hell-bound for eternity. Isabel Godfroie Heart is a slayer accustomed to frying more demons before lunch than a barista blends coffee for the morning rush. When she's dismissed as the Archangel Gabriel's number one Scholar trained in angelic warfare, and takes up knitting only to produce countless six toed socks, she accepts a last-minute job to act as backup on a supernatural jewel heist. But when you're a soul embroiled in the war between Heaven and Hell, plucking an enticing apple never leaves you with anything but rotten fruit. Now she must face a demoness determined to condemn her and her husband Nicolai, outrace a horde of disembodied chomping skulls hell-bent on making her their next meal, and maneuver her way through an ever-shifting maze in Hell's most unforgiving terrain. Never mind the fact the diamond she's retrieving contains a dark entity the labyrinth is determined not to free. But if she doesn't outsmart The Rust's deadly labyrinth, the soul of her unborn child will be lost to Lucifer without means for redemption.